Pima Community College's Student Paper. Veterans Day was Nov. 11. Pima Community College celebrated a little bit earlier this year on Nov. 8 at the Downtown Campus. This Veterans’ Day celebration was coordinated by Pima’s Veteran Group, who has planned this event for the past seven years. 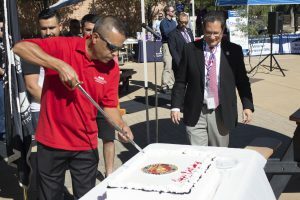 “The celebration is to honor Pima Community College student veterans,” said Jorge Camarillo, student services coordinator for Pima’s Department of Military and Veteran Services. Camarillo is one of the many people who helped make this event happen. 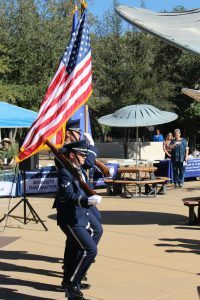 The Veterans Day celebration was a free event that was open to all. It invited different kinds of vendors to come out and support their local veterans while also getting a chance to promote. This year, each business was offered a chance to speak about itself. The Veteran’s Day celebration included free food, music, a 30-minute ceremony that encompassed a speech from Pima’s Chancellor Lee Lambert and a cake cutting for the Marines’ 243rd birthday. Lambert was the guest speaker for this year’s celebration. 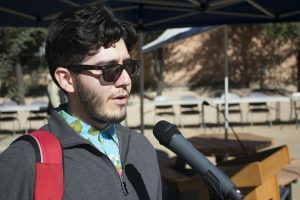 The 30-minute ceremony started off with a rendition of the national anthem sung by Rafael Acuña, a Pima music student with a primary in vocal performance. Rafael Acuna prepares to sing the National Anthem. The event continued with a speech from Lambert, who is also a veteran of the U.S. Army. Alex Rivera of the Kino Vet’s Center cuts a slice of cake for Lee Lambert to celebrate the USMC’s birthday.